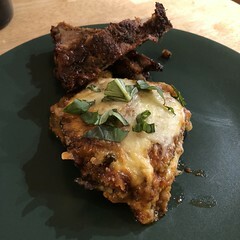 Parmigiana, also known as parmigiana di melanzane or melanzane alla parmigiana is an Italian dish made with layered sliced eggplant with cheese and tomato sauce, then baked. It’s not named for the region, which is be typical of Italian cuisine, it’s named for it’s ingredients. The origin of the dish is claimed by both Southern regions of Campania and Sicily. Other variations, typically found outside of Italy, include chicken, veal, or another type of meat cutlet or vegetable filling. It’s easiest if you prepare the Marinara Sauce or Sugo di Pomodoro – Tomato Sauce first, and then when it’s simmering you can prepare the eggplant. 1. Slice Eggplant about 1/4 inch thick, soak in water and salt. Remove from water and rinse excess salt off. 2. *Beat 2 eggs and *brush the beaten mixture onto one side of the slice of eggplant, sprinkle breadcrumbs covering top. Turn over and repeat, now both sides of eggplant slices are coated with breadcrumbs. 4. Preheat the avocado oil and fry slices until brown on both sides, set the cooked slices aside. 1. Take some of the sauce and coat the bottom of your deep baking pan. 3. **Add a dollop of sauce to each slice of eggplant, top with some grated cheese (Romano or Parmesan) and mozzarella. 5. Bake covered at 350F for about 30 minutes or so. 6. Uncover and let cook for an additional 30 minutes or until mozzarella melts and develops a slightly brown crust, remove and let sit for 10 minutes before serving. ** if the eggplant slices are not breaded, you can sprinkle breadcrumbs on the slices as you layer them, before the dollop of sauce.